Nature in a Walmart lot. After New Orleans and Panacea, we had to bring Bessie back to Camping World for a few of the repairs on our list. 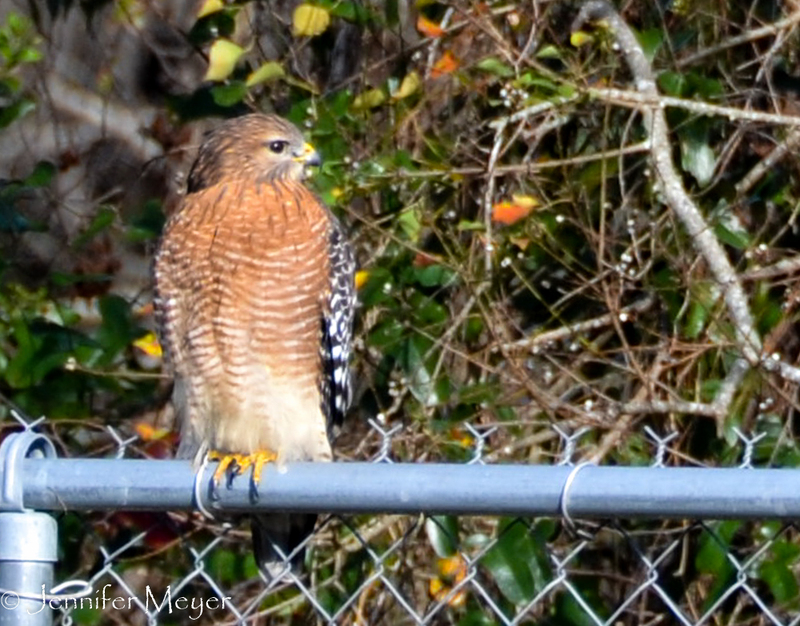 We stayed in the Lake City Walmart parking lot, which was a wild and happening place. There were around 10 other overnighters there, including a couple of semi’s (running their damn diesel engines), and soon after we arrived, three patrol cars arrived with flashing lights to handle a domestic situation in the lot. It still felt safe, though, and we got a fine night’s sleep. 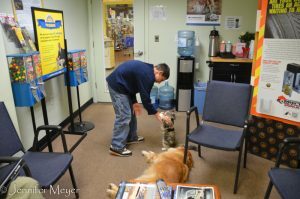 Kid plays with Gypsy in the waiting room. We knew that the parts Camping World had ordered earlier would not be in, but this was an interim appointment to fix a few things that didn’t require parts. They rehung our outside bin doors, with the hope that this make them water tight at last. Added extra latches to the kitchen drawers to keep them from flying out when we make a sharp right. Reseated a few stripped screws on cabinet doors. And they found us a loaner vent cover for the one that flew off somewhere on I-10, promising to get us a perfect match when we come back in January. Going on errands with pets. All this took most of the day. We spent the morning with Bailey and Gypsy in the waiting room, watching Bewitched reruns with one of the employees sons who was off school for the day. 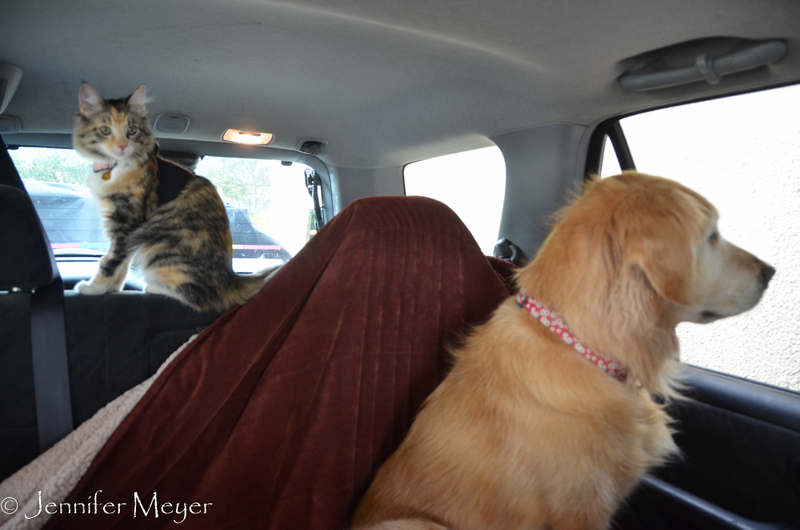 In the afternoon, we put the fur kids in the car and went on a few errands. 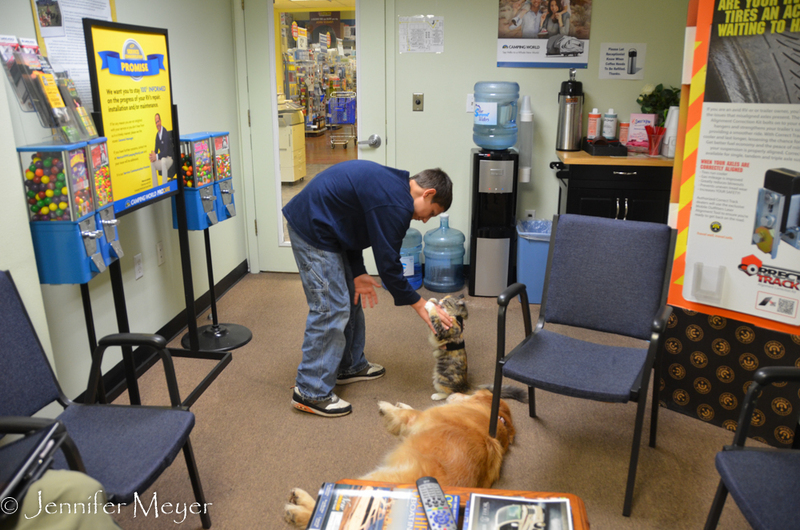 We were on the road by 3:00, and even though RV repairs are always an exercise in patience, we felt well cared for by the employees at this Camping World. I can see why they’ve got good ratings.